"Belief in the One God is dangerous in Cainlan, a city founded on the worship of the god Cain. But when the daughter of a pagan priestess meets the son of a religious fanatic she is drawn to Shem’s caring manner and deep faith. Eliana believes his assertion that the One God will wipe the earth clean of the corruption that fills it, especially when she discovers a terrifying secret known only to those high in the government’s ruling council. Though desperate to escape her destiny, Eliana’s life has been preordained. Not even Shem’s God can rescue her from the fate for which she was born – becoming the next high priestess to Cain." Political intrigue, explosive secrets, an arranged marriage, and a man who's building a huge boat out near the mountains---all these elements make for a great story. 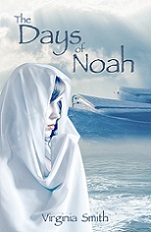 Noah and his family are descended from Adam and Eve's youngest son, Seth. The inhabitants of Cainland are from the line of Cain, Adam and Eve's other son, the murderer. The tension between the two cultures reminds me of what's going on in some parts of the world today. Eliana's character matures by leaps and bounds throughout the story. The reader gets to meet Noah's family, the three sons, Shem, Ham, and Japeth plus grandfather Methuselah. There are parallels to today's political climate, too, with energy being the most valuable commodity and the reason for many of the political conflicts. Virginia Smith has produced another exciting read. It's listed as historical fiction, but I think it could also qualify as speculative fiction. To me, it feels like a cross between Star Wars and Bible history. The mention of energy modules and land-riders gives the setting a futuristic feel, but the presence of the priestess, the temple, and the bloody sacrifices are reminiscent of the Old Testament. I knew how the story would end, but there were plenty of twists and turns in the plot that kept me interested from beginning to end. Excellent choice for historical fiction fans. Disclaimer: Next Step Books send me a complimentary copy of this book with the suggestion that, if I liked the book, I should post a review here and/or on retail bookseller sites.